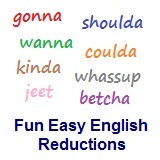 ﻿ Fun Easy English - New American English reductions reduced words used in every day speech introduction. American English reductions are reduced forms of English words. You need to use reductions when you speak English in order to sound more natural. Reductions are used extensively in American TV, movies, music, literature, and in conversations among native English speakers. Reductions, such as gonna, are not real words in English. Why should you learn reductions? American English reductions are usually not taught in English language schools around the world. Watch the reductions introduction comedy video below and then click on a lesson above to begin learning American English reductions. A few more English language reductions for you. These will get individual pages next month....March 2019. Wanna, Gonna, Hafta: Getting Relaxed With Reduced Forms of Speech - A five minute audio program of the written script below. The English is spoken at 75% of normal speed.